First the good news: More pilots and specifically a lot more student pilots. The facts and stats of GAMA indicate that the pilot population is not only ahead of the 15 year average (615,400) but hasn’t been this high for seven years. Strange that in 2009, instructors outnumbered active student certificates by 22,583. The 2010 increase is a significant development given the moribund economy. The ugly? General Aviation shipments continued to drop for the third straight year, decreasing 11.4% to 2,015 units in 2010. Piston deliveries were down 7.7% with 889 delivered. Turboprops declined 17.7%, with 363. Bizjets decreased 12.3% with 763 out the door. There’s good news though. 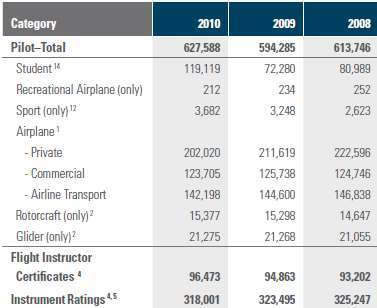 As mentioned, the student pilot numbers are way up, flight activity is increasing and corporate profits + tax policy toward business aviation is expected to make this a growth year. It’s time to get aircraft manufacturers back in the black before another one gets sold to the Chinese. I wonder how many of those new instructors are nervous FOs organising a back up plan in case of furlough? It could be a back up plan but unfortunatley, the pay is even lower than FO pay. “AvJobs” suggests that CFI’s who actually teach comprise only 20% of the total. Most pilots want that credential as part of their resume and hope like heck they never need to use it. Professional flying is a tough gig until you move up the line. Most of my flight instructors wanted to make it in the airlines but have moved on to other careers but there is a pilots shortage looming. Boeing executives say that over the next two decades there will be an estimated 30,000 more planes in the sky worldwide and that 466,650 pilots will be needed to fly them. I’m trying to decide if I’m going to get my instructor rating to teach my kids to fly or leave it to a professional. Probably a lot less yelling involved if someone else is in the right seat. Yup- like teaching them how to drive only a lot more difficult. I’d like to have all three sons learn to fly (they were certified to dive) but not all are interested. If you don’t do the formal CFI training, they can still learn enough from you to accelerate getting their ticket. What do they like better? Flying in or jumping out? So far I’ve only taken my 16 year old daughter skydiving, she loved it! My 14 year old son can’t wait to jump but I think I’ll make him wait another year. I don’t want to ruin him just yet. Once you make a jump everything else is down hill! My youngest son loved it and SN2 wants to give it a try. I’m not yet ready but maybe someday. Might be a good father/ son excursion.